Want a revolutionary way to reduce wrinkles and fine lines while improving skin texture and elasticity? MSMPure™, known as “Nature’s Beauty Mineral” helps nourish the skin, leaving it silky smooth and youthful looking while promoting faster hair and nail growth, and collagen restoration. Looking good means you feel good! Having healthy, vibrant skin shows that you believe in taking care of yourself. 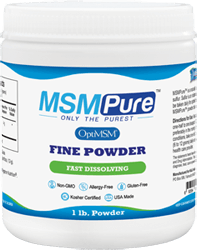 MSMPure™ (MSM Methylsulfonylmethane) is a rich source of sulfur, a key component of collagen growth, a building block of keratin- the main structural constituent for healthy skin, hair, and nails to form. MSM maintains strong disulfide bonds that keep collagen strands strong to preserve connective tissue. By maintaining healthy collagen, hardening of tissue is repressed allowing for long-lasting healthy dermal function and skin your friends will be jealous of. Sun bathing, poor lifestyle choices, environment, lack of exercise, aging, and toxins all contribute to skin damage and aging. MSM revitalizes collagen in the skin, in turn slowing connective tissue breakdown that leads to wrinkle formation and accelerated aging of skin. MSM preserves the building blocks for healthy skin by stimulating specific genes known as COL7A1 & FMOD. These genes are responsible for maintaining healthy skin tissue connectivity. MSMPure™ topicals penetrate the skin deep enough to help clear and revitalize the skin. MSM regulates the chemicals in the body responsible for the maintenance of the skin barrier to make cells more permeable and improve the absorption of nutrients. It also helps regulate and distribute moisture/water through the epidermis to establish and maintain healthy vibrant skin.